You can post a credit adjustment, which decreases an account balance, to a patient's ledger. 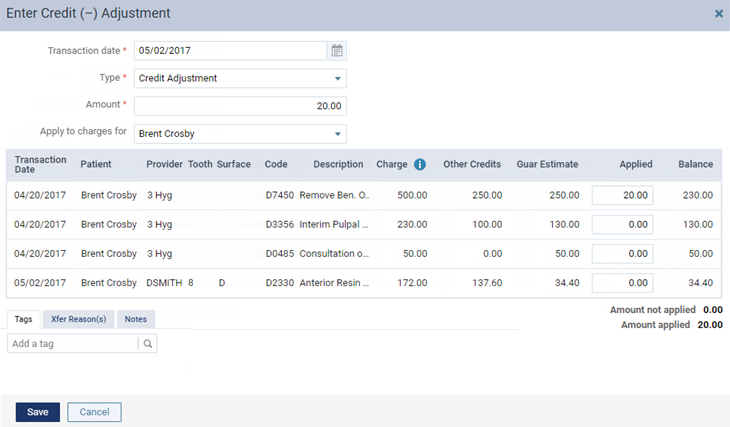 On a patient's Ledger page, click (or tap) Credit Adjustment. The Enter Credit (-) Adjustment dialog box appears. 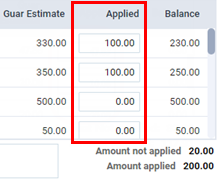 Enter the adjustment details, such as the type and amount. Type - The adjustment type, such as Credit Adjustment or Professional Courtesy. Apply to charges for - The adjustment is to be applied toward charges on the current patient's account or the account of another member of his or her household. If you select [Guarantor], you can apply the adjustment to charges for any or all household members. The adjustment amount is applied automatically to the procedure with the oldest date of service and then to subsequent procedures based on the date until the adjustment amount is used up. However, you can change the Applied amount for any procedure in the procedure list as needed. Type any relevant Notes regarding the adjustment.